Scripture memory has never been my strong point. I know it's important, but to be honest, I struggle with it. I've tried different methods. I signed up and started Hide His Word challenges, with varying amounts of success, but I've never totally finished one. 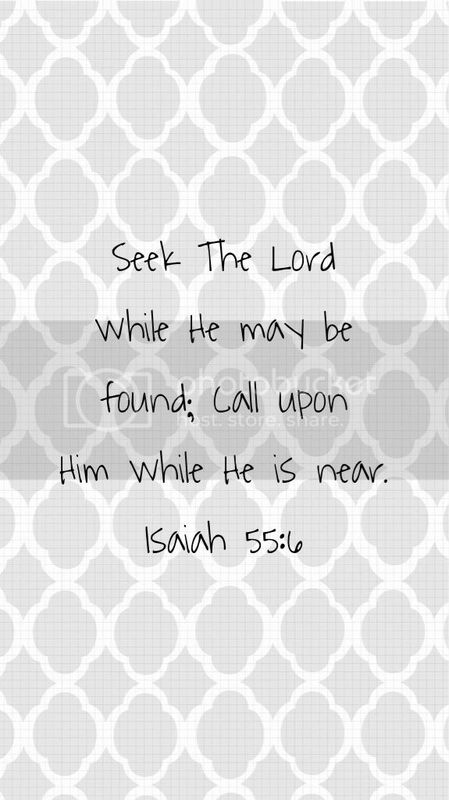 This time, when I signed up for Isaiah 55, I determined to see it through. I need God's Word hidden in my heart. When Jesus was tempted in the wilderness, He fought Satan with a powerful weapon that we have full access to - the Word of God. You may not always have your Bible, but if you've memorized Scripture, you're always armed and ready for battle. When I have Scripture in front of me all day, I stay focused on it. It's always at the back of my mind. So many times I've seen the verses I'm learning in a new light - through a sermon, a Bible study, or a book - because it was on my mind, and I was able to add to it through different sources. Again, we can't use the Word unless we know the Word. 1. Verse cards: Every Sunday, I write the week's verse on index cards - one to carry with me in my purse, one to keep at home. I have no excuses for not studying if my verses are always with me. 2. First Letter cards: This is my favorite way to review! 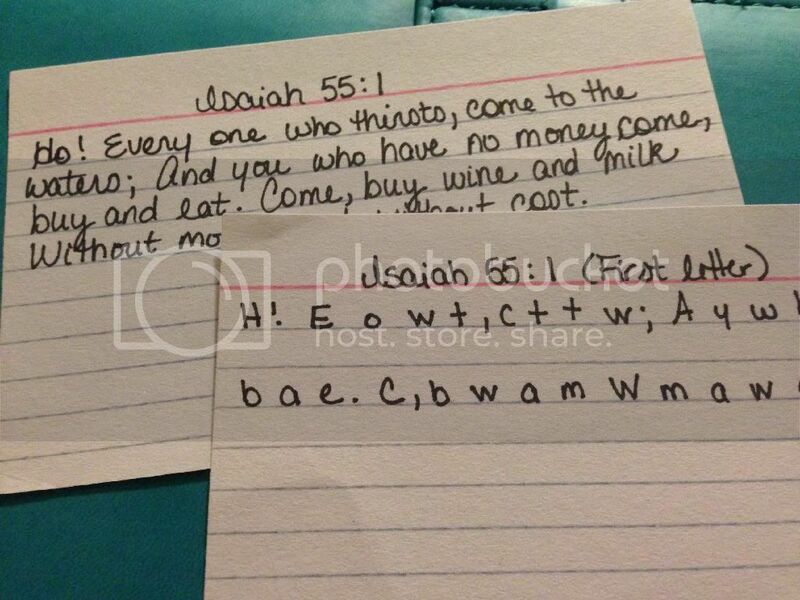 If I'm struggling with a verse, just seeing the first letter of the next word is usually enough to jog my memory. 3. Sticky notes: I don't do this every week, but if I'm really struggling with a verse, I'll write it on sticky notes and post them around the house - on the bathroom mirror, above the washing machine, and so forth. 4. Journaling: I start each day with my gratitude list in my journal, then I write out that week's verse and track how many times I review it. 5. Scripture Typer app: This is one of my favorite iPhone apps! Scripture Typer makes it so easy to study verses. It even provides reminders when it's time to review, so nothing slips through the cracks. 6. Lock screen: Using my favorite iPhone photo editing app (Rhonna Designs), I create a lock screen design with the the verse I'm working on. Any time I use my phone, I can easily review my verse. Does memorization come easily for you, or do you struggle with it? What are your favorite memorization methods or tips? Leave a comment and share them - I'm always looking for new ideas! You probably already have a "place" for your Bible study and prayer, a place where you daily meet with God. But do you have a "space" for it? 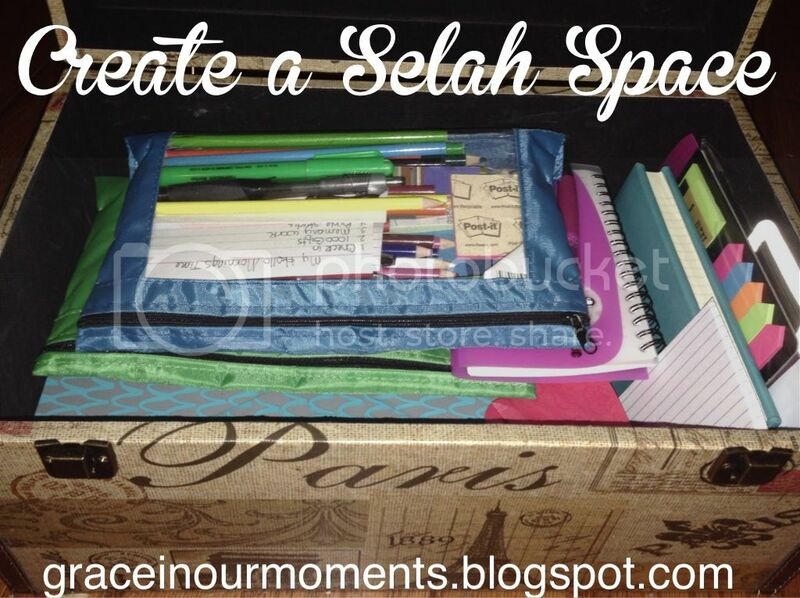 Even if you have limited room, you can create a "Selah space" - a place to pause, listen, and reflect on God's Word each day. 1. Find a workable space. What works is different for everyone. It depends on your home, yours and your family's schedules, and what makes you comfortable. Some people have an office area. Others like the kitchen table, so they can spread out their notebooks and study supplies. When my husband and I first got married, we lived in a huge 3,000 square foot parsonage and I used our double walk-in closet for my quiet time. Now we own our own (smaller) home, and I spend my mornings with God on our living room couch. I don't wake anyone up, it's comfy, and I have space to sprawl out and work. Get everything you need for your quiet time and put it all together. This can be anything from your Bible, journal, and pens, to a blanket and a candle. Whatever you need to be cozy and spend time with God, take it to your space. For me, it's my Bible, journal, Sharpie pens, colored pencils, sticky notes, and my favorite blanket. This doesn't have to be anything fancy. Grab a pretty basket or your favorite tote bag and stash your Bible, your favorite journal, your Bible reading plan, and whatever else you need. I found this beautiful little Paris trunk at Ross for $11.00. Since I'm kind of obsessed with Paris and it matched our living room decor, I bought it. It sits at the end of our couch. It's the perfect size for my Bible study stash, and I'm not digging for my Bible in the dark at 5:00 a.m.
Keep it simple. Throw a couple of decorative pillows on the couch. Put a candle out. Frame printables of your favorite verses. Take a few minutes to make your space your own. With a few minutes of prep time, you can create a quiet, welcoming place to meet with God. It's a perfect motivator for spending time with Him. We know we need time with God. We've heard it a thousand times: we can't give away what we don't have. We can't be the wife, mom, daughter, sister, employee, or woman we need to be if we don't first fill ourselves full of God. But the things that create our great need for Him are the very things that make it hard to find time with Him. Everything else in our lives clamors for our attention, and we push our time with God to the back of the list. I struggled for years to find my niche when it came to Bible study and prayer. I tried groups and plans, books and online studies, detailed guides and unplanned time. I finally learned the truth: there is no "right way." My time with God has changed with the seasons of my life. Over the past twelve years, I've moved from stay at home mom to part-time working mom to full-time student, and now to working mom. You don't have to set aside a whole room, but create a space where you meet with God daily. My space is our living room couch. It might be your kitchen table, or your deck, or even your car. Designate a space that is yours for meeting with God. There is no "one size fits all" schedule, but without some kind of plan, you will most likely find yourself aimlessly wandering through your time with God. Write out a simple list of the things you want to accomplish. For me, it's 1000 gifts (my gratitude list), scripture memory, Bible study, prayer and journaling. 4. Choose a Bible study. There are SO many to choose from, but don't get overwhelmed. There are great free resources out there to help you get started. 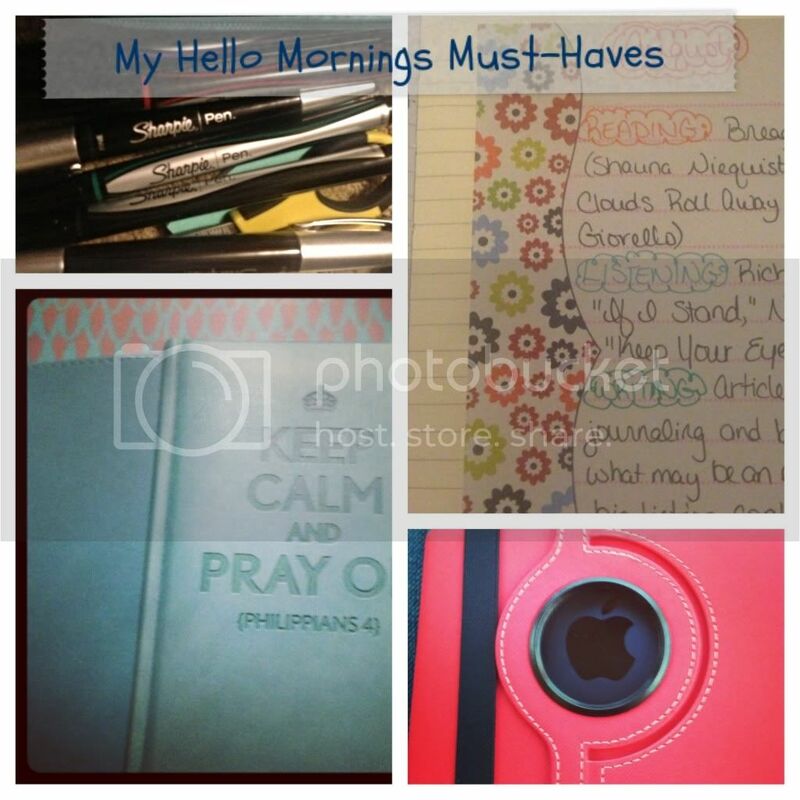 A few that I love are Hello Mornings/Quench Bible Studies, She Reads Truth, and YouVersion. If you're serious about spending time with God, read Savoring Living Water by Katie Orr and Laura Williams. This book is amazing! Find a friend or family member to hold you accountable for spending time with God. Or sign up for Hello Mornings. Not only does this amazing site provide Bible studies, but it provides a whole accountability program, bringing together women from all over the world. Sign ups for the next session start Monday, February 17. Check out one of the dozens of groups on Twitter, Facebook, or Instagram - including my CST Twitter group, Morning Grace. I won't promise you that you're going to be perfect. I won't promise it will always be easy. But I will promise you this: it's worth it. Make time for God in your life, and you'll be amazed at the difference He makes. The past few weeks, I've shared my experiences with journaling, why I journal, and different types of journaling. I spent years trying different journaling styles, until I found the perfect blend that works for me. Today I'm giving you a sneak peak at my own journal. My journal falls under the "smash book" category. It's a hodgepodge of quotes, lists, writing, and more. 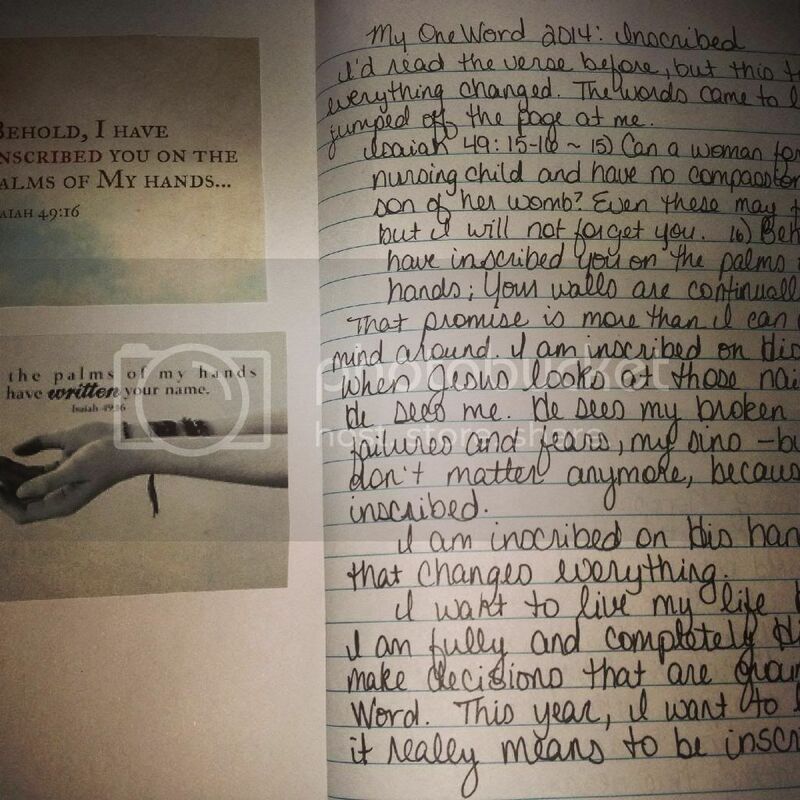 I journaled about my "One Word" for 2014 and started an inspiration page - verses and quotes reflecting my word, "inscribed." I take notes from my Bible study. This year, I'm reading through the Bible. I keep lists of what I'm reading (or want to read), the music I can't get enough of, etc. because my journaling is so impacted by this. Journaling is such an important part of my time with God, but I want to point out one thing to watch out for - keep your focus on time with God. Journal as part of your time with God, not in place of it. I have enjoyed sharing my journaling experience with you! If you'd like to learn more, follow me on Instagram @graceourmoments - you can follow from the icon in the sidebar. I share lots of journaling photos there and would love to connect with you! I make my coffee and pull out my Bible and journal, lingering over it all. I savor the peacefulness of a slow start, waiting until sleepy-headed boys stagger into the living room, rubbing their eyes. My oldest now looks me in the eye, and my youngest stands up to my chin. They're hardly my "little" boys anymore. They plop down on the couch until they wake up ever so slightly, then they’re ready to cook. My youngest has the recipe memorized. 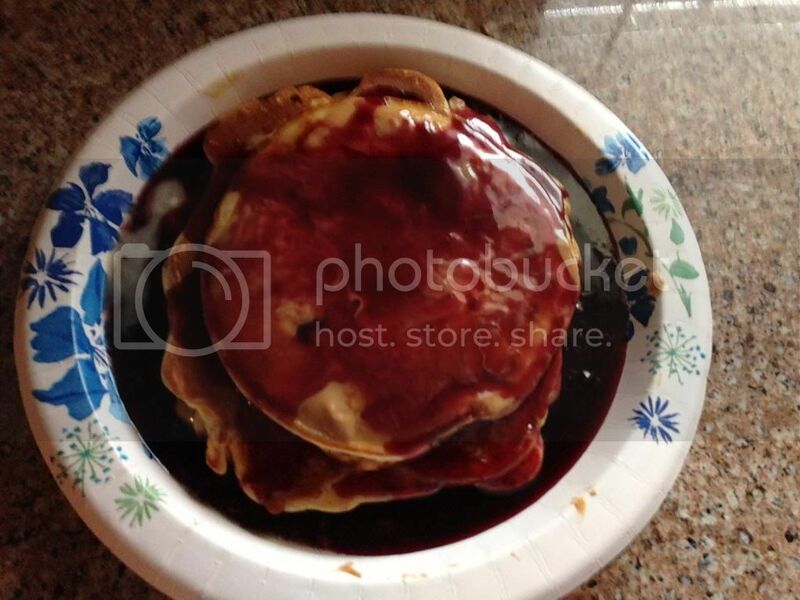 He pulls out the flour and baking powder and eggs, insisting on cracking at least one egg. He mixes the batter while my oldest pulls out butter, syrup and peanut butter, all the fixings for later, then starts the stove. He pours the batter and flips the pancakes as I watch. I don't warn him to be careful anymore because he can do this as well as I can. My youngest pulls out plates and forks, ready for the first pancake to come off the skillet. As we sit down to eat buttery pancakes and crispy bacon, I breathe a silent prayer of thanks for these times with these boys. It's bittersweet. As much as I love it, my heart hurts, because I have such a short time left with them. In five years, my oldest will graduate high school. My youngest will follow in eight. I'm not ready for this season to end. Why won't time just slow down? Time doesn't slow down, though, so I’m trying instead to slow myself down. I’m savoring little moments—cuddling as we watch TV, family dinners at the table, hours-long Monopoly games as we strategize and munch on chips and cheese dip. I want to spend time talking, really talking, to my kids about the important things in life and the silly little everyday things. I want to laugh with them. I want to burn the memories of this life into my brain, because it won’t last forever. Our normal, our everyday, is changing fast. I learned from my own growing up years that life isn't made of the big moments. They'll remember those, too—the trips to Disney World, Christmases with piles of gifts, monster truck shows and concerts. But the biggest memories of their childhood will likely be the smallest ones—the snippets of everyday life that happened over and over. They'll remember pancakes on Saturdays, the whole family cuddling and giggling before bed, homeschool work in the Sunday School rooms while their daddy works in his office. The big things are fun, but life isn't made of big things. It's made of a thousand tiny moments, weaving together to form a big picture. I want my kids to look back and love that picture. I want them to know that in the everyday, they were loved beyond measure. "I am inscribed on His hands, and that changes everything." 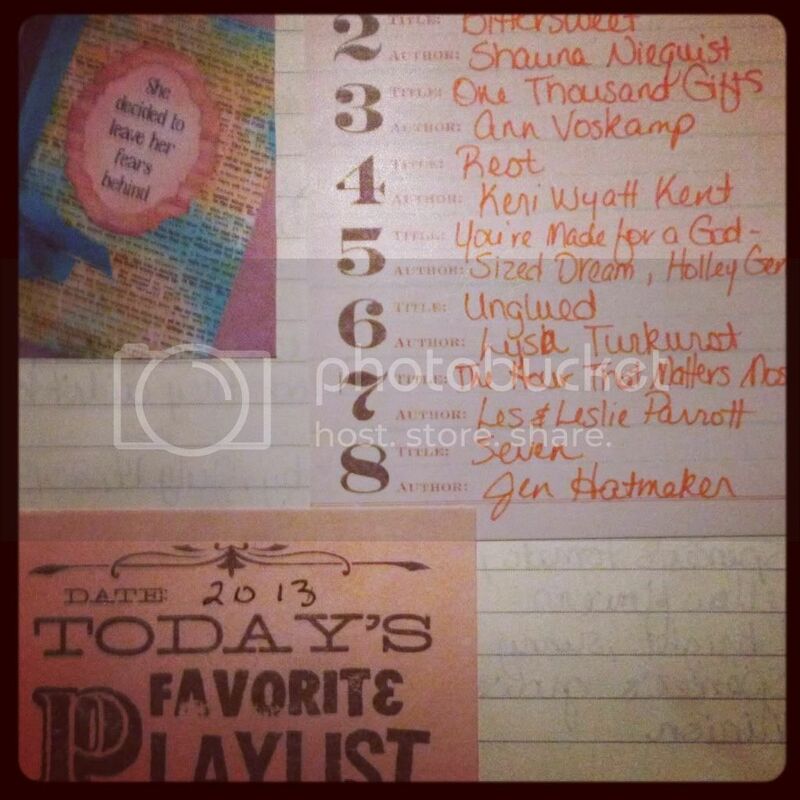 One month ago, I started the new year off with my OneWord Resolution: inscribed. 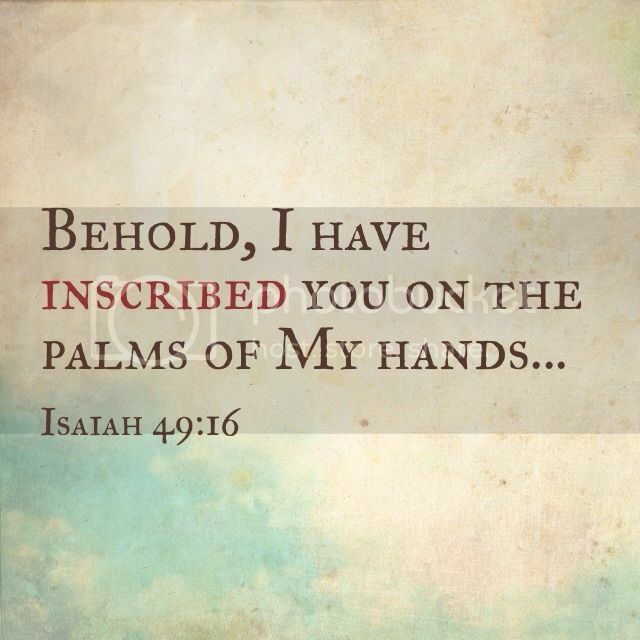 I dove into learning about the God who loves me enough to inscribe me on His hands (Isaiah 49:16). I expected an impact. I was ready for big things. I wasn't ready for this. Leave it God to turn this whole thing upside down. And I will put enmity Between you and the woman, And between your seed and her seed; He shall bruise you on the head, And you shall bruise him on the heel." From the beginning, from the very first sin, God knew what it would take to save us. We were already inscribed, because Jesus was willing to pay the price for us. In His eyes, we were worth saving. 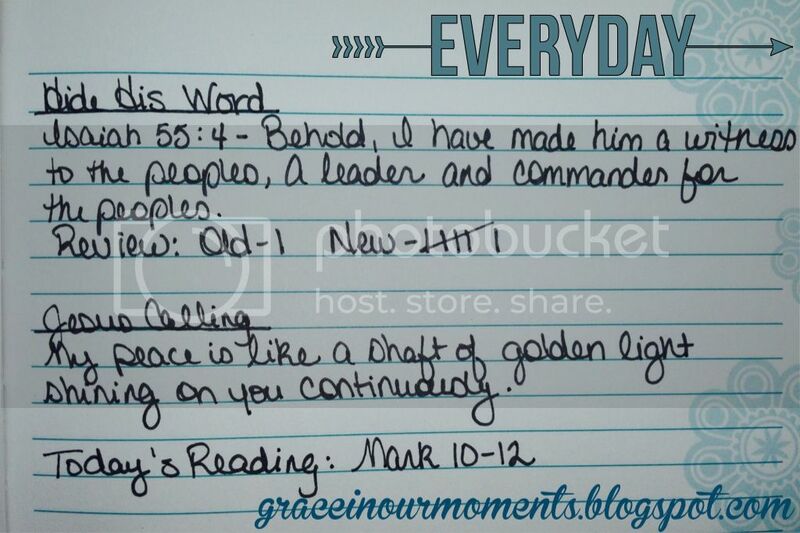 Jump ahead with me, to week four of my Bible reading. This time I was in Matthew, reading about Jesus' crucifixion. He suffered. He gave His life willingly - for me. For all of us. He could have stopped it all, but He didn't. That day, as He hung on that cross, He inscribed me on His hands. The veil in the temple - the physical barricade that separated people from God's presence - was torn in two when He died. When Jesus died, our separation from God died, too. 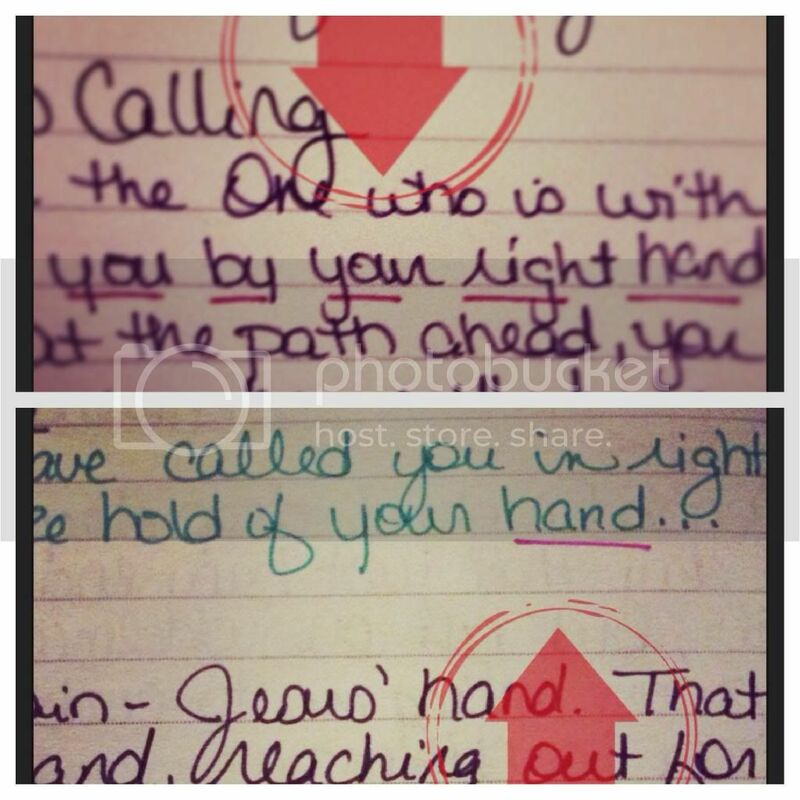 He didn't just write my name on His hands, where it could be erased, wiped away, and forgotten. He engraved my name on His hands - He inscribed it - He carved it into His hands. He will never forget me. He gave me everything. I can never repay the debt He forgave. How dare I think this whole thing is about me? I thought this journey, this focus on "inscribed," would be about His love for me. It is, in part. But in more ways, it's about my love for Him, and how His love changes me. It leaves me speechless. Overwhelmed. Humbled. I am inscribed, and that changes everything.